Place the pistachios, basil, mint, garlic and cheese in a food processor. Pulse and blend until the nuts are coarsely chopped, then with the processor on, stream in 1/3 cup of olive oil. Add a little more if necessary, depending on how “spreadable” you want your pesto to be. Taste the pesto and add in the salt, blending once more. This will make a little extra pesto than needed, so store it sealed tightly in the fridge for up to a week. Place a pizza stone inside you oven on the middle rack. Preheat the oven to 260 degrees C. You most definitely need a pizza peel for this – or at least something to easily transfer your dough to your stone. In a large bowl, mix together the water, yeast and Mossop’s Field & Tawari liquid honey. Let that sit and get foamy, about 10ish minutes. During that time, I like to get out all of my pizza ingredients and measure them out – because this dough doesn’t have to rise! You want everything measured out and ready to top so you can quickly transfer the dough to the stone. After 10 minutes, stir the flour and salt into the yeast mixture. Stir until the dough comes together, first using a spoon and then using your hands. If the dough is REALLY sticky, use a little more flour until it becomes silky, adding 1 tablespoon of flour as needed. Flour your workspace and knead the dough a few times with your hands. Let it sit for 5 minutes. Roll the dough out as thin as you possible can – at least 10 inches. If the dough keeps springing back, let it rest another 5 or 10 minutes. Flour your pizza peel VERY well. To transfer the thin dough to your peel, I gently and quickly fold the dough in half and then in half again, pick it up, and unfold it on the floured peel. Spread a layer of pesto on the dough. Cover with the mozzarella and romano. Open the oven and gently slice the pizza from the peel to the stone – I use a spatula to help if needed. Bake the pizza for 10 to 15 minutes – just keep and eye on it since the oven is so hot and stones can differ. It will be done when the crust is crispy and cheese is golden. 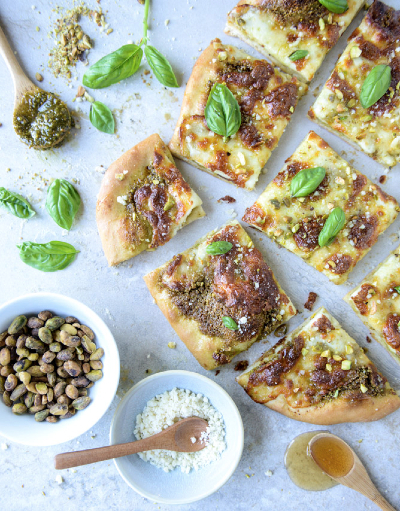 Remove the pizza and drizzle with Mossop’s Field & Tawari liquid honey. Cover with an additional romano sprinkling, the pistachios and basil leaves. Slice and serve.